Obituary for Angela Lee Morrow | Crandall Funeral Home Inc.
Angela Lee Morrow passed away on May 27, 2018. She was born on September 3, 1966 in Evanston, Wyoming to Frank and Barbara Morrow. She enjoyed hunting, fishing, camping, and nature walks. 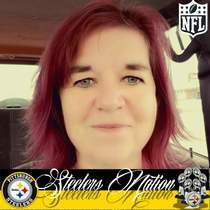 Angela was a huge Pittsburgh Steelers fan and loved her cats deeply. Angela is survived by her children James Largent, Jordan Largent, Ty Sweeny, and Keely Milroy. Grandchildren Addy and Rylan; Brother Matt Morrow; grandma Fru Bruce; she is also survived by Jo , Lance , Jeff , Davis , Debbie , Oly, and Amy. Angela was preceded in death by Grandpa Bruce, Barbara Bruce and Frank Morrow. In lieu of flowers donations for funeral expenses would be very much appreciated. A memorial service is planned for Saturday, June 9, 2018 at 2 pm at the Lyman Heritage Barn 44054 I-80 Business Loop 80 in Lyman, Wyoming.